At Dorset Tea, we’re inspired by the natural life, colour and vitality of Dorset every day. Alongside the launch of our new herbal infusion Wild about Mint tea, we’ve come up with 5 clever ways to bring a little more green into your life. Get your hands dirty and do some good for the environment by planting a tree this January. The National Forest Company runs regular tree plantings which help to develop woodlands. Hit the hills and revive yourself with a ramble in the countryside. The National Trust has a great listing of walksin Dorset. 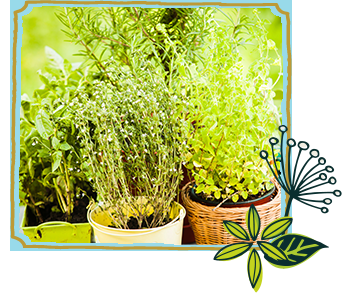 Mint, Basil and Chives can all be grown easily in your window box planter or an urban garden or allotment; perfect to add a little flavour to your dinner times. 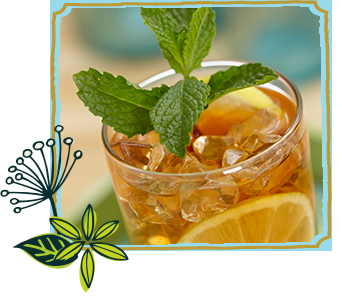 Whip up a batch of these tasty mint cocktails with your Wild about Mint teabags. Put the mint green teabags into a large jug and add 600ml boiling water. Add the sugar and allow infuse for 4 minutes. Decorate your glasses by running a wedge of lime around the edges and dipping the glasses in sugar. Put some ice in your cocktail shaker with the mint leaves and shake well. Add 200ml of the cooled mint tea, 100ml or vodka and 2 tsp lime juice and shake. Pour the mixture into the glasses and garnish with mint leaves and a wedge of lime. Get green with these funky home and wardrobe accessories! 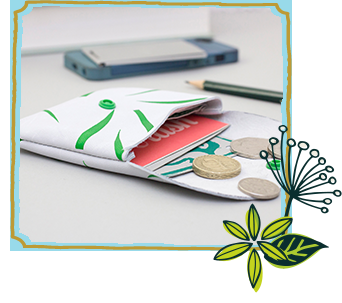 Dress up drab autumn clothes with a colourful brooch or treat yourself to this grass print leather coin purse. Visit our Tea Shop to stock up on Wild About Mint fruit infusions now.